​"The M. E. Church, South disposed of their Church building on King St. and it was bought by the Presbyterians." ​"A Congregational meeting was held and it was decided to purchase a lot corner of Market and Lee St. from Mr. U. B. Quimby for $900.00 to erect a Church building." ​The Onancock Presbyterian Church became a part of the newly organized Norfolk Presbytery. ​A large Congregation assembled this morning to witness the dedication of the new Church edifice. The pastor was assisted by Rev. 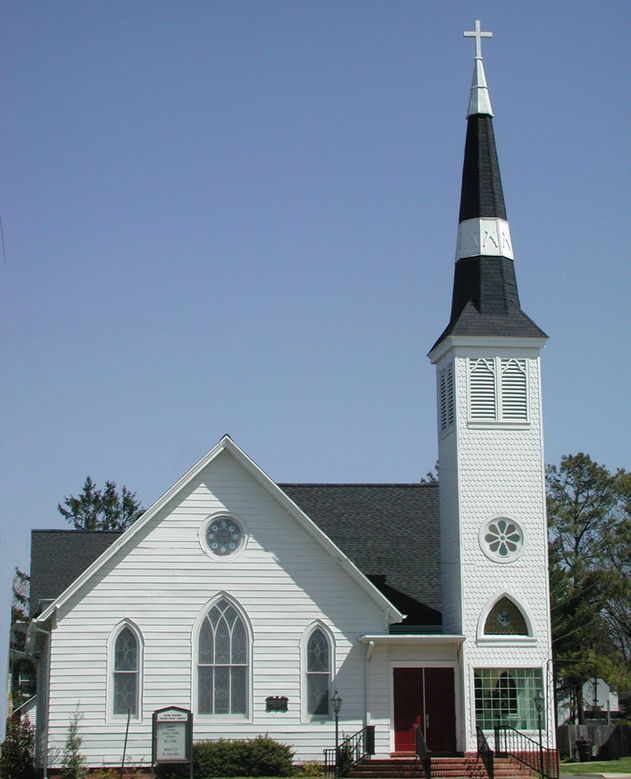 Hart of the Onancock Baptist Church and Rev. Dr. W. W. Moore, Professor of Hebrew Union Theological Seminary. Dr. Moore preached and after the sermon dedicated the edifice to GOD by prayer." Session Book A-1. ​The Onancock Presbyterian Church changed the name to Naomi Makemie in memory of Francis Makemie's beloved wife (Naomi Anderson). ​A Moller pipe organ was installed for $3,295.00. ​Dedication of the new Educational Building. ​A Manse was erected on Holly St.
​Commenced rebuilding of Narthex, Tower and Steeple to repair old termite damage. Rather than simply rebuild the tower in its old location, it was enlarged a few feet in two directions which allowed us to install a handicapped lift. ​Complete Restoration of all the Stained Glass Windows (remove, restore and re-install). ​The men of the Church remodeled the Makemie Room, including a new drop ceiling and new lighting fixtures following the installation of Air Conditioning in the Education wing of the building. ​In 2008, the Church steeple was hit by lightening and set on fire. The tower and steeple were rebuilt with modern materials and were back in service in less than six months (other than using the side door for entering, the services of the church were not interrupted by the fire). ​With professional help in the installation of the hardwood flooring, the men of the Church reworked the Chancel in the Sanctuary for better use and appeal.